Don’t ask me how, but I managed to get a ticket to the Cast & Crew Premiere of Prometheus at the Empire Cinema in London’s Leicester Square last night. Though it was disappointing not to see director Ridley Scott or the cast, who are probably saving themselves for tomorrow’s red carpet Premiere (a part of me was hoping I’d get to sit next to Charlize Theron, you can probably guess which part), the experience of going to see a film with nothing but film fans and people who respect the art, in a stunning cinema, was amazing, even if there was a bit of a post-movie crowd crushing to retrieve handed-in phones afterwards. Plus, I saw it three days before the rest of the general public, which makes me feel special. In 2089 a group of scientists, led by Shaw and Holloway (Noomi Rapace and Logan Marshall-Green) discover ancient cave paintings on the Isle of Skye depicting giant humanoids reaching up to 6 orbs in the sky. The drawing matches others found all over the world, and point towards a distant planet that may hold some key to the origins of mankind. Four years later, the scientists arrive at the planet LV223 as part of a 17-man crew aboard the Peter Weyland-funded ship Prometheus. Once there, the crew find traces of alien life, but are the answers they receive the ones they were hoping for? Ridley Scott made Alien, arguably the greatest sci-fi film ever made and his greatest movie to date, 33 years ago. In the meantime he’s made some iconic films (Blade Runner, Gladiator), some great films (Thelma & Louise, Black Hawk Down) and some good, but not groundbreaking works (American Gangster, Matchstick Men), but he’s never lived up to his early masterpiece. His last great film was Black Hawk Down in 2001, and since then his works haven’t really set the world alight, so no-one can blame him for wanting to relive past glories. Dipping back into the Alien well can only be a good thing, surely, and it seems this is one of the most anticipated films of the year, with prequel hype not seen since The Phantom Menace. Fortunately this isn’t George Lucas, and this isn’t Star Wars. 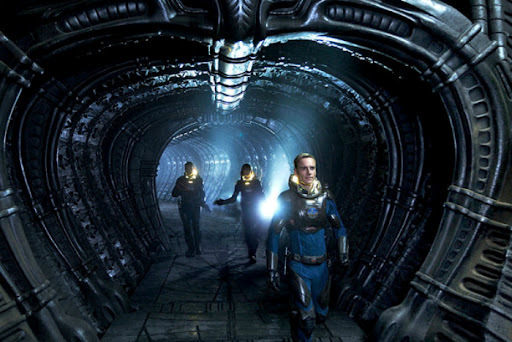 Whilst no Alien, or even Aliens, Prometheus doesn’t disappoint – much. There’s only one area that I can really criticise it for, so I’m going to get that out of the way before I laud it’s praises. The script is terrible. Not necessarily the dialogue, although that isn’t great, but the whole story is so full of gaping plot holes that it’s incredibly distracting. I’m trying to keep this review spoiler free, so all the plot holes I came up with are going to be written into a second post uploaded after this one, so after you watch the film you can see what I mean, and if you really enjoyed the film then don’t read it, as it’ll spoil it a bit more. If, like me, you left the cinema having enjoyed it but feeling not quite complete, then go ahead and read to feel enlightened. The script, written by Lost co-creator Damon Lindelof and newcomer Jon Spaihts (he wrote the screenplay for the Emile Hirsch train wreck The Darkest Hour) is the only weak link of the film, and it’s pretty fragile. Whether it’s poorly developed caricatures where leading characters should be, foggy motives or an unclear plot, there’s rarely a point at which the story keeps it together. Bizarrely, there’s both too much and too little exposition, as some aspects go unexplained whilst others are clearly signposted for future developments. Everything mentioned in the first 45 minutes will be used later on, without fail. A few more weeks spent on the story could have made this a solid 9/10 movie, up there with the other classics from the franchise, but unfortunately it wasn’t meant to be. It seems Scott was in too much of a hurry to make a successful, good film that he didn’t wait around for a good story, just taking what was around. OK, negativity out of the way, let’s hand out some compliments. The film is breathtakingly beautiful. Opening with stunning Icelandic scenery, it’s difficult not to get lost in the waterfalls and mountains. The visual effects are incredible too. We’re introduced to a race known as the Engineers that are so utterly believable you forget they aren’t real. The sets are phenomenal, as is the attention to detail in the costumes and character designs, and there’s enough references to the rest of the franchise to keep fanboys happy, including some set-ups that could eventually lead into Alien, 37 years later within the film’s timeline. Rapace’s heroine Shaw is the obvious parallel with Sigourney Weaver’s Ripley. 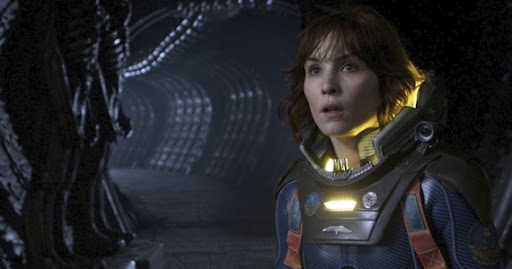 Both are strong, eventually independent women who spend an inordinate amount of time in their underwear, though Shaw is given so much characterisation comparatively to the rest of the crew that it’s clear she is the main character from the start, whereas with Alien the screentime and details were kept roughly equal. That’s another area where the film doesn’t play to it’s strengths. It was smartly marketed as not being part of the Alien franchise, more a part of the same universe but telling it’s own story, but there are so many parallels that this doesn’t hold up. Whether it’s shots mimicking the discovery of the egg chamber, characters wielding a flamethrower or an impossible basketball shot straight out of Alien Resurrection, they can’t quite seem to detach themselves from the story. The international cast does well with what they are given, but the one-note characters they play bring them down. Charlize Theron is the icy, almost robotic (but not a robot, though for a while I was convinced) Company representative Vickers, Idris Elba the schlubby, blue collar captain Janek, Rafe Spall is amiable, cowardly biologist Millburn, Sean Harris the beligerent, bullish geologist Fifield and Guy Pearce makes an early appearance via hologram as the aged Peter Weyland seen in the incredibly effective promotional material. Standing out from the rest though is Michael Fassbender as the ship’s android, David. He flat out steals the show as a less advanced synthetic creation than those seen in later films. More of a butler than a robot, David is the first ‘person’ we meet on the ship as he goes about his duties before waking up the crew from a 28-month snooze. His movements and speech patterns are limited and restrained, making him come off ever so slightly sinister and creepy. Rapace is good, but Marshall-Green (who looks too much like Tom Hardy for my liking) doesn’t sell it as a scientist, he just looks too pretty. The initial story set-up is promising. The crew of the ship here are mostly unlike any seen in this franchise before. Where Alien featured a blue-collar working crew who didn’t ask for what happened to them, Aliens saw a bunch of gung-ho marines charging into the fray and Alien³ was set amongst a religious prison cult (I can’t remember what happened in Alien Resurrection), here we have scientists and researchers going on a venture of discovery to further mankind. Where Alien (I can’t stop making the comparison, sorry) had several key scenes, this one only has a couple. One is truly difficult to watch, with Rapace’s Shaw going through an ordeal almost as bad as she endured in The Girl With The Dragon Tattoo. As I said, the film is absolutely spot-on in almost every way apart from the story, which unfortunately plays a pretty big role. There’s enough here to make it worth a watch though, and fans of the other films won’t be disappointed. This entry was posted in 07/10, Choose Film, Empire Top 301, New Release, Review, The List and tagged Alien, Charlize Theron, Damon Lindelof, Guy Pearce, Idrix Elba, Logan Marshall-Green, Noomi Rapace, Prometheus, Rafe Spall, Ridley Scott, Sean Harris by jaycluitt. Bookmark the permalink. Couldn't believe I got to go! Watching any other film just isn'y going to be the same again though. Paid for it the next day, had an 8-hour meeting at work after 4 hours sleep and a 3-hour journey back from London. Worth it.